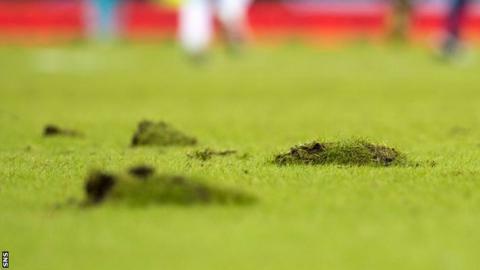 The company responsible for Scotland's national football stadium has said it is "regrettable" that the pitch was in a poor state for the weekend's Scottish League Cup semi-finals. Dundee United beat Aberdeen and Celtic overcame Rangers but the playing surface was widely criticised. Peter Dallas, managing director of Hampden Park Ltd, said heavy rain and cold weather had hampered the pitch since it was re-laid in November. That followed its use at Glasgow 2014. Hampden was temporarily turned into an athletics stadium last summer for the Commonwealth Games. The semi-finals were the first high-profile matches to be played at the ground since the conversion was reversed and it was evident that the pitch was cutting up. Following his team's 2-0 win over Rangers on Sunday, said the surface was "way below the standard we should play on" and scorer Kris Commons complained that it was too soft and caused players to fall. "It is regrettable that the new Hampden Park surface did not meet expectations during the Scottish League Cup semi-final weekend," said Dallas. "This was due in part to the excessive rainfall and freezing temperatures that have hindered the development of the pitch - an issue that has not been unique to the national stadium this winter - but, also, the timescale of restoration work undertaken since the Commonwealth Games. "Preparing Hampden for the Commonwealth Games and returning the stadium for football has been a very detailed and in-depth operation. "The new pitch was laid in November last year and we had worked closely with Glasgow 2014 to ensure the works started at the earliest opportunity." The Scottish Professional Football League has written to Hampden Park Ltd to raise its concerns about the pitch. SPFL chief executive Neil Doncaster, in a statement, said that the company had "clearly...not delivered" on its assurance of a high quality pitch at the weekend. He added: "The SPFL pays a significant sum of money for the use of Hampden Park for these matches. "We require that Hampden Park provides a quality pitch in excellent condition for our prestigious cup matches. "The players of the teams involved in these special games deserve to enjoy the best possible football pitch conditions to allow fans in the ground and supporters watching on TV around the world to be entertained." Dallas said his organisation will be working to present the pitch "in the best possible condition" for the League Cup final between Dundee United and Celtic on 15 March, Scotland's friendly against Northern Ireland 10 days later and the Euro 2016 qualifier against Gibraltar four days after that.